You can plan your perfect river day with Wild West Voyages. Raft, kayak, or stand up paddle; full service guided river tours, or gear rental with shuttle service for the do-it-yourself experience. Half day, full day, sunset and overnight adventures on the Colorado River as well as multi-day trip on the Green River in Labyrinth Canyon. Guided hiking tours and 4WD expeditions. Now offering package adventure days! Call for information about customized trips and group discounts. 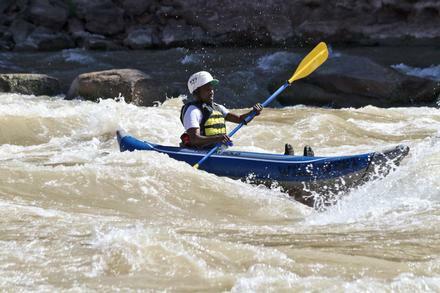 Inflatables are the kayak of choice on the Moab Daily!